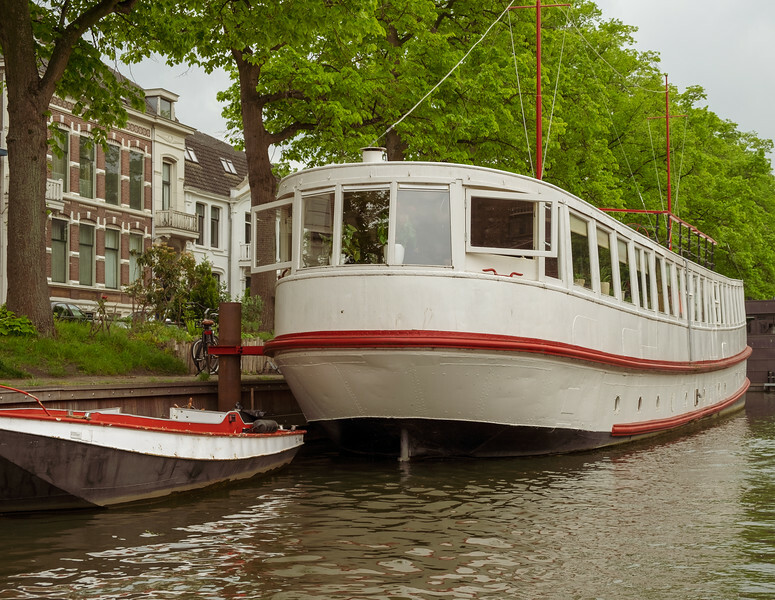 After checking out the Bloemenmarkt (flower market) in Utrecht, Netherlands we rented a small vessel to cruise the canals all by ourselves. This was a huge highlight of the trip for us and me (Rob). Shortly after launch we passed by this jaunty little boot (boat). At the time we floated past this boat I new I liked it but it was only upon further reflection that I noted the many reasons I think it is special. First, the white color seemed clean and well maintained; second, the choice of such a lovely red as a highlight color really gives it a kick; third, the curved nature of the bow with the flat windows (along with the red trim) give the boot a happy regard; fourth, the red tie-down points below the two open windows are such a great detail; and lastly, those open windows on each side kind of seem like fancy spectacles. This image was taken handheld on May 13th 2017 in Utrecht, Netherlands using the Fuji X-T10 and the Fuji 18–55mm lens at 32.9mm, 1/300s, f/5.6, and ISO 200. Editing was performed in Lightroom.